George Trager (also known as Gus Trager) was born in Gefell, Germany in 1861 and arrived in America in 1876. He studied photography in Whitewater, Wisconsin and opened his first photography studio in 1888 with Frederick Kuhn in Mazomanie, Wisconsin. Trager and Kuhn moved to Chadron, Nebraska the following year and purchased the Bon Ton Art Gallery from Alice Luce. The photographers sold scenic landscape pictures to travelers who stopped in Chadron on their way to the South Dakota spas of Hot Springs and the gold-mining towns of Deadwood and Lead City. In 1890 the duo opened a studio in Crawford, Nebraska near Fort Robinson, some 26 miles from Chadron, and Trager’s nephew Ernest joined the partnership. The men traveled and photographed Chadron, the plains, local events, prominent people, and interesting events which they sold to the curious public. During this time, Trager also associated with photographers William Henry Jackson and John Anderson, which perhaps explains why photographs taken by each photographer have been sold under the names of the others. Trager, Kuhn, and Trager also traveled to the Pine Ridge Indian reservation where they photographed the Lakota Sioux. Their first trip was to see cattle slaughter in a mock hunt similar to the way buffalo were hunted. Trager was in the area at the time of the Ghost Dance but did not photograph it. That distinction belonged to J. E. Meddaugh who took the only known photographs of the Ghost Dance. Perhaps Trager missed out on this business opportunity because of his nephew’s serious illness. Nonetheless, tensions from the loss of reservation land, a new Indian agent, and the Ghost Dance led to the Wounded Knee Massacre on December 29, 1890. 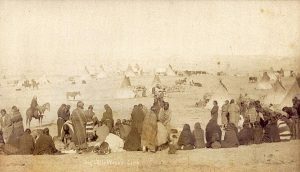 Trager was one of the first to photograph the Wounded Knee battlefield and its aftermath. Clarence Grant Morledge of the Omaha World-Herald also photographed the scene and later collaborated with Trager to sell the pictures. Some photographs clearly attributable to Morledge appeared on Trager mounts. At this time Trager also began an association with Joe Ford who had collected battlefield mementos, and the two sold Wounded Knee photographs and artifacts in Chadron in conjunction with the M. E. Smith and Company store. Apparently the partnership with Kuhn had already ended. The striking pictures of the dead and wounded sold widely to soldiers and travelers in the Chadron and Pine Ridge areas. Additionally the pictures powerfully influenced the American public since they showed the reality of the event. Trager and Ford went on to establish the Northwestern Photographic Company for the purpose of selling their photographs and soon added W. W. Hayword as a partner. They advertised over 200 views of the Indian unrest (these probably included some of Morledge’s pictures) and the photographs sold very well. Trager was also known to compromise his work in the interest of sales. For example, he changed a subject’s name if he felt the person didn’t look the part. The demand for the Pine Ridge photographs lessened in mid 1891. Trager and Ford traveled to Wyoming to prospect. Trager returned to Chadron but left for Fremont, Nebraska in 1892, returning to Chadron again near the end of that year. From then on, all trace of him is lost. Nephew Ernest Trager retained the negatives that he had made with his uncle and with Morledge. Some of these negatives were donated to the Nebraska State Historical Society by an individual who found them in a Trager family home. Other negatives were ultimately sold to the Denver Public Library. The Museum of Nebraska Arts has one work by George E. Trager. Carter, John. “The Image Makers.” Nebraskaland, Oct. 1987: 34– 41. Jensen, Richard E., R. Eli Paul, and John E. Carter. Eyewitness at Wounded Knee. Lincoln & London: University of Nebraska Press, 1991.